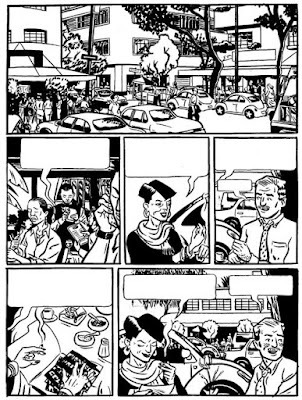 This is a sample page I inked a few years ago while trying to figure out the look for a story set in Mexico City (the La Condesa neighborhood in this page). I’ve abandoned the story, probably permanently, but you never know…. I really like the style since it reminds me of Daniel Torres’ work. I have loved his style since I saw Roco Vargas in Heavy Metal Magazine. I have been reading Drawing Words and Writing Pictures and really enjoying it. I am also a big fan of your book ’99 ways’. Hey thanks, that’s a nice compliment (s)! I didn’t have Torres specifically in mind but that’s a good call for the look I was going for: clean line but inky/brushy.